I want to estimate, graph, and interpret the effects of nonlinear models with interactions of continuous and discrete variables. The results I am after are not trivial, but obtaining what I want using margins, marginsplot, and factor-variable notation is straightforward. I did not need to create dummy variables, interaction terms, or polynomials. As we will see below, convenience is not the only reason to use factor-variable notation. Factor-variable notation allows Stata to identify interactions and to distinguish between discrete and continuous variables to obtain correct marginal effects. This example used probit, but most of Stata’s estimation commands allow the use of factor variables. The average of the change in the probability of being married when each covariate changes. In other words, the average marginal effect of each covariate. The average of the change in the probability of being married when the interaction of divorce and education changes. In other words, an average marginal effect of an interaction between a continuous and a discrete variable. The average of the change in the probability of being married when the interaction of divorce and pdivorce changes. In other words, an average marginal effect of an interaction between two discrete variables. The average of the change in the probability of being married when the interaction of percentile and education changes. In other words, an average marginal effect of an interaction between two continuous variables. The first part of the margins output states the statistic it is going to compute, in this case, the average marginal effect. Next, we see the concept of an Expression. This is usually the default prediction (in this case, the conditional probability), but it can be any other prediction available for the estimator or any function of the coefficients, as we will see shortly. When margins computes an effect, it distinguishes between continuous and discrete variables. This is fundamental because a marginal effect of a continuous variable is a derivative, whereas a marginal effect of a discrete variable is the change of the Expression evaluated at each value of the discrete covariate relative to the Expression evaluated at the base or reference level. This highlights the importance of using factor-variable notation. I now interpret a couple of the effects. On average, a one-year change in education increases the probability of being married by 0.022. On average, the probability of being married is 0.043 smaller in the case where everyone has been divorced once compared with the case where no one has ever been divorced, an average treatment effect of \(-\)0.043. The average treatment effect of being divorced two times is \(-\)0.124. The average marginal effect of education is 0.039 higher when everyone is divorced two times instead of everyone being divorced one time. The average marginal effect of education is 0.040 higher when everyone is divorced two times instead of everyone being divorced zero times. The average marginal effect of education is 0 when everyone is divorced one time instead of everyone being divorced zero times. Another way of obtaining this result is by computing a cross or double derivative. As I mentioned before, we use derivatives for continuous variables and differences with respect to the base level for the discrete variables. I will refer to them loosely as derivatives hereafter. In the appendix, I show that taking a double derivative is equivalent to what I did above. Analyzing the interaction between two discrete variables is similar to analyzing the interaction between a discrete and a continuous variable. We want to see the change from the base level of a discrete variable for a change in the base level of the other variable. We use the pwcompare and dydx() options again. The average change in the probability of being married when everyone is once divorced and everyone’s parents are divorced, compared with the case where no one’s parents are divorced and no one is divorced, is a decrease of 0.161. The average change in the probability of being married when everyone is twice divorced and everyone’s parents are divorced, compared with the case where no one’s parents are divorced and no one is divorced, is 0. We could have obtained the same result by typing margins divorce, dydx(pdivorce) pwcompare, which again emphasizes the concept of a cross or double derivative. Now I look at the average marginal effect of an interaction between two continuous variables. The Expression is the derivative of the conditional probability with respect to percentile. dydx(education) specifies that I want to estimate the derivative of this Expression with respect to education. 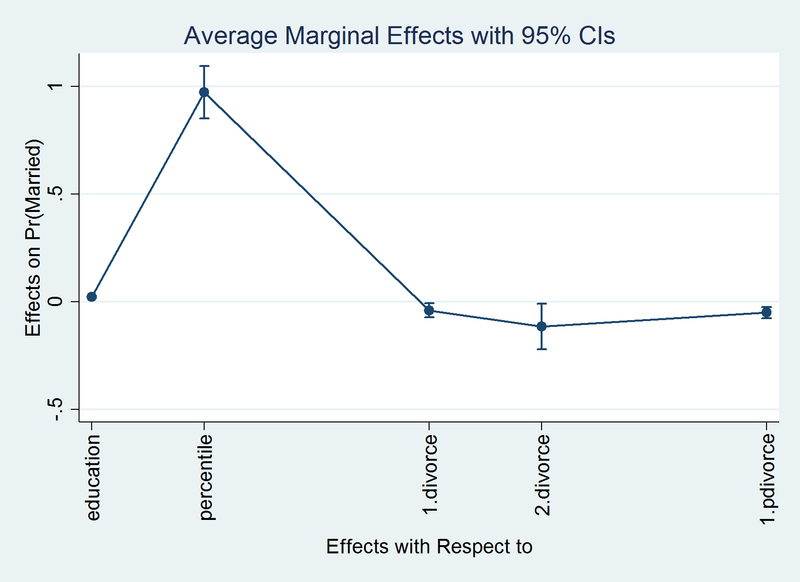 The average marginal effect in the marginal effect of income percentile attributable to a change in education is 0.062. Because margins can only take first derivatives of expressions, I obtained a cross derivative by making the expression a derivative. In the appendix, I show the equivalence between this strategy and writing a cross derivative. Also, I illustrate how to verify that your expression for the first derivative is correct. I illustrated how to compute, interpret, and graph marginal effects for nonlinear models with interactions of discrete and continuous variables. To interpret interaction effects, I used the concepts of a cross or double derivative and an Expression. I used simulated data and the probit model for my examples. However, what I wrote extends to other nonlinear models. Warning: expression() does not contain predict() or xb().